As designers working with communities touched by injustice, we are often presented with a double challenge. On the one hand, we need to be able to speak of situations of inequality, systemic violence and discrimination as urgent matters requiring immediate action. On the other hand, we need to do so in a way that does not represent people as mere victims of injustice but rather celebrates the agency of the individuals and groups directly experiencing those injustices. Their voices not only express great courage and frankness in the face of immense difficulty: they also contain the key element for activating change at the level of policy-making and policy-enactment. 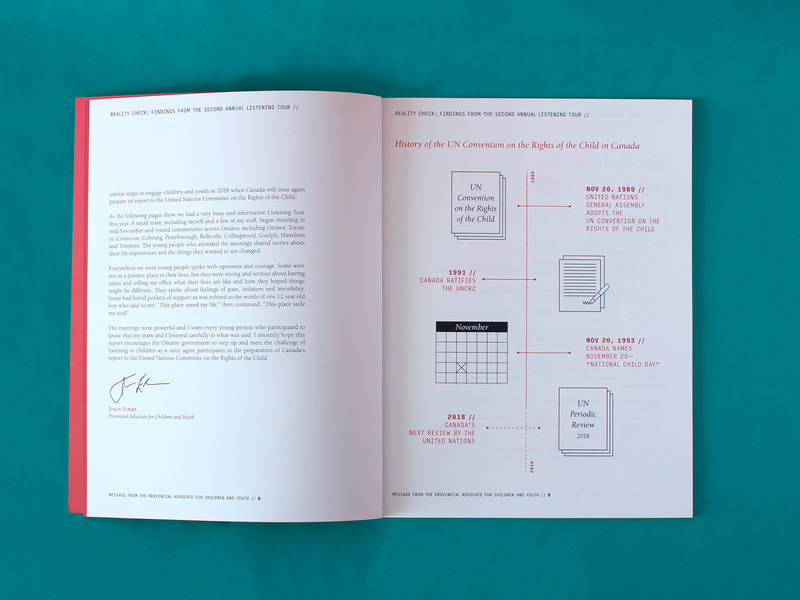 This was precisely our challenge when designing the report Reality Check: Findings from the Second Annual Listening Tour. Led by the Office of the Provincial Advocate for Children and Youth, the Listening Tour is an annual initiative for young people living in Ontario to speak about their experiences in systems of care, offering direct feedback on the government’s promise of a safe and nurturing environment towards their development. The Advocate’s Office measures the status of this promise against the United Nations Convention on the Rights of the Child (UNCRC), an international, legally-binding agreement on the rights of children and youth across the world, of which Canada became a signatory in 1991. The uniqueness of the Office’s approach in reporting to the UN Committee on the Rights of the Child lies in inviting children and youth to partake directly in the conversation about the status of their rights. 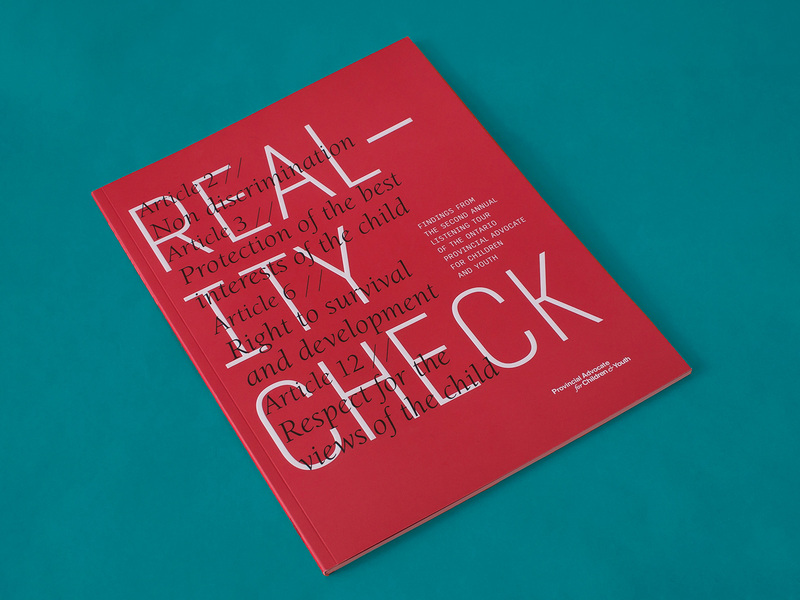 When measuring this gap between reality and promise, the Advocate’s Office studied youth testimonies against articles 2, 3, 6 and 12 of the UNCRC, which state “Non discrimination,” “Protection of the best interests of the child,” “Right to survival and development,” and “Respect for the views of the child” as the guiding principles to ensure children and youth thrive across the world. Graphic explorations of two realities in coexistence: the one described by the UNCRC’s articles and the lived-experiences of youth in care. 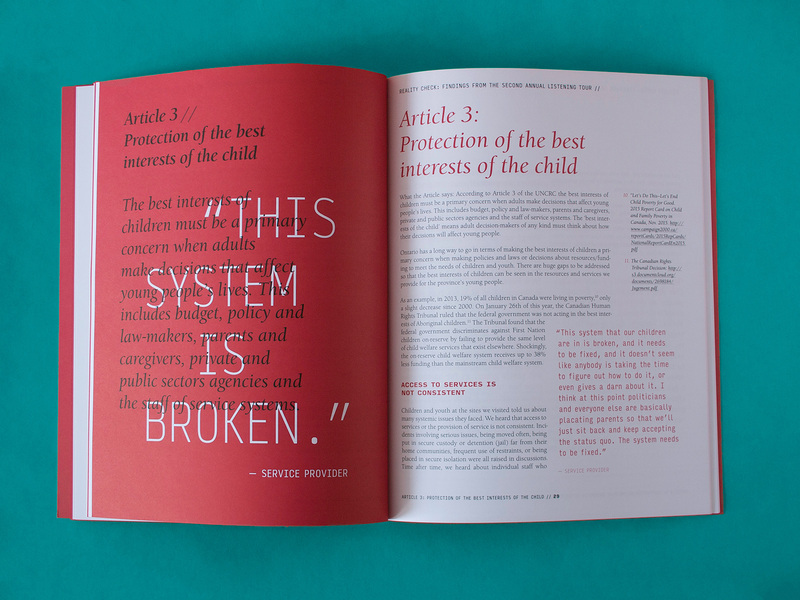 In addressing this gap ourselves, our strategy as designers was to develop a visual juxtaposition of the UNCRC’s articles with the statements given by the children during the Listening Tour. This juxtaposition helped signal the concerning breach between the desired situations of equality described by the articles, and the realities of young people living in care (realities which account for both the urgency of addressing a failing system, while also speaking of the incredible strength of these youth in the face of injustices). 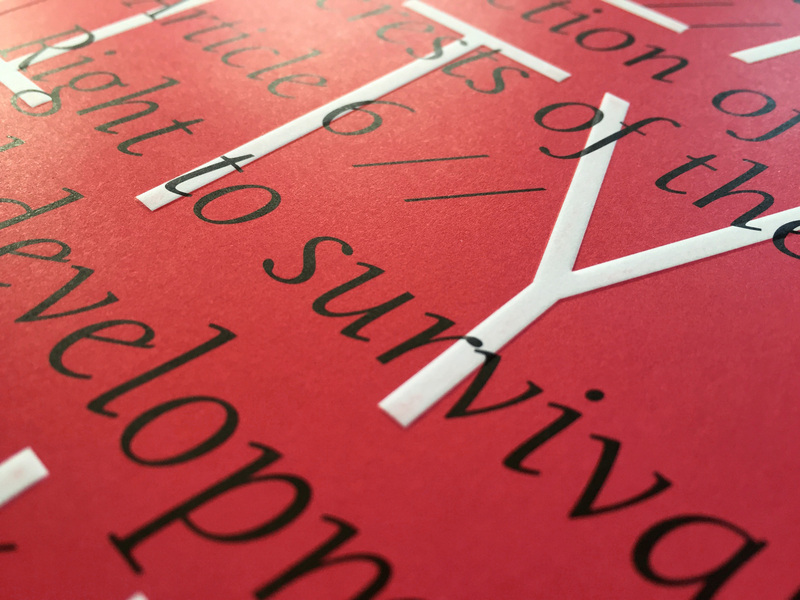 In giving due prominence to the words of young people, we also decided on embossing the cover of the report, thus creating the effect of children’s stories “raising” from the page. 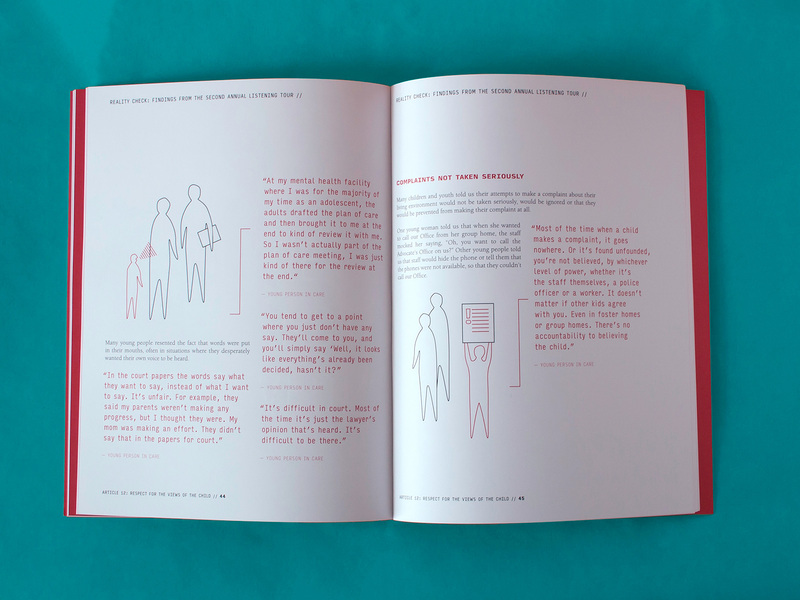 Throughout the report, their statements were visually conveyed as blocks of red text—design devices disrupting the linear flow of the main text; markers of both the force of the speaker, and the criticality of her phrase. In this way, young people’s voices act as a ‘reality check’ on the idea that their rights are equally protected in Ontario. We accompanied these quotes with line-drawing representations of the rights violations described by the youth. Our challenge, once again, was navigating the tension between having to visually depict instances of violence and discrimination, while also steering away from representations of children in care as mere “victims” with no say on their own lives. The findings of the Listening Tour revealed there is still much work to be done to effectively overcome the distance between these youth’s lived experiences and the ideals that should be describing those experiences in the first place. In this context, a key message arises from the the voices of children in care: spaces of healing can only become possible when we take a moment to truly listen.